Uh oh! Dr Slot has been tinkering with that time machine of his again, but it appears he’s made a miscalculation! Instead of a quick hop back 25 years to the mid-90s, he’s shot back 2.5 MILLION years, all the way to the dawn of mankind. In his usual style though, he’s turned it into a fruitful opportunity by excavating a brand new game: Fossil Fruits mobile slots! This prehistoric slots spectacular is locked to 20 win lines and features a mammoth progressive Jackpot that will keep climbing until it’s won. Dr Slot has also invented the Wheel of Wins mini-game, and you’ll find towering banner special symbols to help you hunt and gather extra prizes. We may be back in the Stone Age, but you’ll need a device that isn’t! Fossil Fruits is compatible with iOS 10 or Android 5.0 and above. 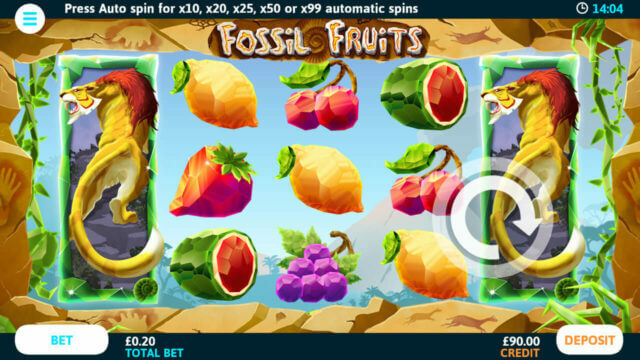 As Fossil Fruits is fixed to 20 win lines, all you need to do is set your bet-per-line. Just tap the ‘Bet’ button and use the ‘+’ and ‘-’ buttons to change your bet. Your bet-per-line will always be multiplied by all 20 win lines to create your total bet. For example, bet 10p a line and your total bet will be £2. You can choose any bet-per-line from 1p up to £5. As you change your settings, the amount in the ‘total bet’ box will adjust automatically. Those fossilised fruits may be old relics, but the game sure isn’t! It has an Auto Spin feature to do the hard work for you if you’re busy hunting woolly mammoths or sharpening your spear. Just tap the ‘Auto Spin’ button within the ‘Bet’ menu and pick a number of spins. You’ll need to set a minimum credit level too, and Auto Spin won’t let you fall below this. Want to stop playing if you uncover a huge win? Just set a maximum win level here too. We may be 2.5 million years in the past, but some things never change. Win lines still always pay from left to right, and you can only win once on each win line. So if you line up more than one winning combination on a single line, you’ll only receive the highest value win. It is possible to win on several win lines at once though. If you manage that, all of those prizes will be added up into a rocking total win! Any wins you excavate from the Fossil Fruits dig will usually be a multiplier of the bet-per-line you set earlier. Different symbol combinations are worth different multipliers, and generally the more symbols you line up, the more you win. With some symbols, you’ll only need to line up two on an active win line to dig up a win. With others, you’ll need a minimum of three. For full information on what each combination is worth, tap the menu button and check out the cave paintings in the paytable. Fossil Fruits has two very special symbols that you’ll want to look out for. They feature a fearsome sabre-toothed tiger, and the catch of the day roasting on an open fire. These three-storey banner special symbols can span all three levels on the reels, although they may also appear across just one or two levels at a time. So, you’ve got your settings just right, spun the reels and watched them roll to a stop. What next? Well, it’s time to see if you’ve won! If you’ve lined up one of the winning combinations from the paytable, you’ll see those winning lines spring into action. At the same time, your win will appear on screen and automatically make its way into your credit before any of those sneaky sabre-toothed tigers can snap it up. The Neanderthals that Dr Slot has encountered so far have definitely lived up to their wild reputation, but it turns out they’re very friendly! In fact, those caveman Wild symbols can be the missing link to help you salvage a win from a losing spin. Wilds substitute for most other symbols on the reels and can make up a winning combination. Let’s say you gathered two fossilised lemons on an active win line with a Wild alongside. Then, the Wild would act as a third lemon and you’d hunt down a win worth three lemons. They’re not fully evolved yet though, so they can’t stand in for Free Spins or mini-game symbols. You also can’t win the progressive Jackpot with a caveman Wild on your win line. Only five matching fossilised Jackpot 7s can help you drag that Jackpot back to your cave. Now Dr Slot wouldn’t take credit for creating the wheel, but his Wheel of Wins mini-game might just be his best invention yet. Line up two or more wheel symbols on an active win line to take it for a spin! Just tap the spin button to set those multiple wheels in motion. If you land on a multiplier, you’ll collect it and drag it back to the main reels. Land on an arrow though, and you’ll progress inwards to the next wheel, where the multipliers are larger than those on the last. If you keep landing on arrows and make it all the way to the centre of the wheel, you’ll win the mammoth prize in the middle! Line up 3, 4, or 5 fossilised Free Spins symbols in any order on an active win line and you’ll get 3, 5, or 7 free spins respectively. That’s not all though! When you enter Free Spins mode, something very exciting happens. The dormant volcano will erupt and fling several extra banner special symbols onto the reels, giving you even more chances to line up a winning combination. As you’re not paying for these spins yourself, those prizes can really pile up. Just be aware that your bet settings will lock during Free Spins mode (probably due to the heat of all that lava) so you won’t be able to change your bet-per-line until you return to normal play. Is this your first time-travelling slots adventure with Dr Slot? When you join him for the first time, you’ll receive up to 120 free spins and up to £1,000 in deposit match bonuses! * Sign up today and play for historic wins in Fossil Fruits! *T&Cs apply. 40x wagering on bonus credit. The occurrence of 5 (five) “JACKPOT” Jackpot symbols on an active win line awards a progressive Jackpot. The progressive Jackpot is available on any bet, with 0.005% of the bet being added to the progressive pot. There is no hidden reserve pot. When the Jackpot is won, it is reset and begins to rise again. Simultaneous wins can occur, if another player wins the progressive Jackpot then a notification to this effect would occur BEFORE the current player was awarded the Jackpot. The game Jackpot seed value is £2000. The Jackpot is individual for this game, it is not shared with any other games. In the event of a communication error after a progressive win result has been determined and before it has been displayed on screen, the win amount will automatically be transferred to the player’s account. While the game is live, the Jackpots cannot be terminated. Fossil Fruits has a theoretical return to player of 94.5%. This is based on long term playback. System malfunctions void all payments. Monies are staked in the following order: winnings, player deposits, bonus credit. Dr Slot general T&Cs apply.